For the first time ever, all five three-year-olds in the Mid-Atlantic Thoroughbred/The Racing Biz Top Midlantic-bred Poll hail from one state. The poll, the first of 2018, was released Friday. 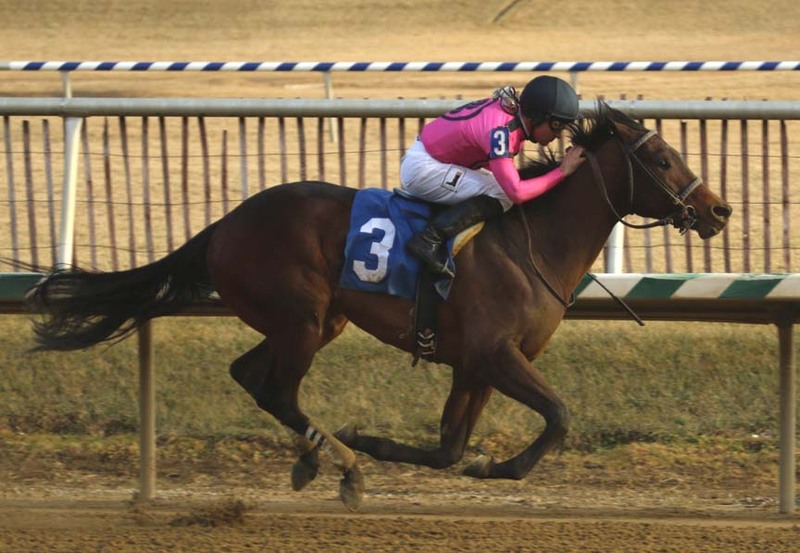 The Mid-Atlanic Thoroughbred/The Racing Biz Top Midlantic-bred Poll is comprised of nearly 30 media members and other participants in mid-Atlantic Thoroughbred racing. Until later in the year, it is divided up between three-year-olds and older horses. The top five three-year-olds in the three-year-old version of the poll were all bred in Maryland. Their number is led – narrowly – by Still Having Fun, with 53 points, just seven more than Blamed. Still Having Fun, an Old Fashioned colt, is trained by Tim Keefe and was bred by him in partnership with Mr. and Mrs. Charles McGinnes. He is owned by Gary Barber, Wachtel Stable, and Terp Racing. Still Having Fun both of his 2018 starts and three of four overall with career purse earnings of $164,453. Thus far in 2018, Still Having Fun has won the Frank Whiteley, Jr. Stakes and the Miracle Wood Stakes, both at Laurel Park and is expected to run in the Private Terms, also at Laurel, on March 17. Blamed, the runner-up in the three-year-old poll, has won four of five in her career. The Blame filly, bred by Sagamore Farm, has won a pair of stakes at Sunland Park, the El Paso Time Stakes and the Island Fashion Stakes, prep races for the $200,000 Sunland Oaks to be run March 25. The rest of the top five among three-year-olds includes Enchanted Ghost, the Ghostzapper filly who won the Wide Country Stakes; Limited View, a multiple stakes-winning daughter of Freedom Child; and Global Citizen, a To Honor and Serve colt who ran second in the Jimmy Winkfield Stakes. Among older horses, Unique Bella, the Pennsylvania-bred filly who won the Eclipse Award as top female sprinter of 2017, took top honors in the first poll of the year. The four-year-old daughter of Tapit won her seasonal debut with consummate ease, taking the Grade 2 Santa Maria Stakes at Santa Anita Park under a hand ride on February 10. Unique Bella was bred in the Keystone State by Brushwood Stable and is trained by Jerry Hollendorfer for owner Don Alberto Stable. In her career, Unique Bella has won seven of nine starts and earned $712,400. She is followed by the Virginia-bred One Go All Go, who has run second in a pair of graded stakes this year; the now-retired New Jersey-bred Rainbow Heir; New Jersey-bred four-year-old Irish War Cry; and the Pennsylvania-bred sprinter Favorite Tale. Of the 10 horses in the twin polls, five were bred in Maryland, two each were bred in Pennsylvania and New Jersey, and one was bred in Virginia. Six of the 10 were males, and four were females. Still Having Fun (MD) — colt by Old Fashioned-Casual Kiss, by Dehere; bred by Tim Keefe and Mr. and Mrs. Charles McGinnes; owned by Gary Barber, Wachtel Stable, and Terp Racing LLC; won Miracle Wood S., Whiteley S.
Blamed (MD) — filly by Blame-Salsa Star, by Giant’s Causeway; bred by Sagamore Farm; trained by Joel Marr for Cleber J. Massey; won El Paso Times S., Island Fashion S.
Limited View (MD) — filly by Freedom Child-Loves to Glance, by Not for Love; bred by Barbara G. Smith; trained by John Salzman, Jr. for himself, Fred Wasserloos, and George Greenwalt; won Marshua S.
Global Citizen (MD) — colt by To Honor and Serve-Tizthen, by Tiznow; bred and owned by Sagamore Farm and trained by Horacio DePaz; 2nd Jimmy Winkfield S.
One Go All Go (VA) — by Fairbanks-See Ashleigh Run, by Marquetry; bred by Albert P. Coppola; trained by Charles Dickey for Rodney Paden; 2nd G2 Mac Diarmida S., 2nd G2 Ft. Lauderdale S.
Rainbow Heir (NJ) — by Wildcat Heir-Rainbow Pride, by Prospectors Gamble; bred by New Farm; trained by Jason Servis for New Farm; won Gulfstream Park Turf Sprint S.
Irish War Cry (NJ) — by Curlin-Irish Sovereign, by Polish Numbers; trained by Graham Motion for owner-breeder Isabelle de Tomaso; 2nd G3 Hal’s Hope S.
Favorite Tale (PA) — by Tale of the Cat-Tricky Elaine, by Grindstone; bred by Paul Conaway; trained by Guadalupe Preciado for PJG Stable; won Dave’s Friend S.